Since it was so well received last week, we’ll continue using the SOAP method of scripture for some posts this week. Then he called the crowd to him along with his disciples and said: “Whoever wants to be my disciple must deny themselves and take up their cross and follow me. For whoever wants to save their life will lose it, but whoever loses their life for me and for the gospel will save it. What good is it for someone to gain the whole world, yet forfeit their soul? Or what can anyone give in exchange for their soul? Jesus tells us that His disciples must take up their cross. That sounds a little unpleasant to us, and our western ears, but in Jesus day, to take up your cross would be a terrifying thing. The cross was a means of death in that day, a terrible, painful, humiliating, awful death. It was the means that Rome used to make a example of someone. It was the public hanging of it’s day. And that’s what Jesus calls us to do. He calls us to take up our cross. The cross, in Jesus day, was not the serene symbol of peace that we have made it to be. It was a means of execution. And that is what Jesus calls us to. Jesus doesn’t just call us to death (thankfully!) but He calls us to live as well. He tell us whoever lives for the Gospel will find life, and is truly alive. He tells us that if we live for our life, we will lose it, but if we live for the Gospel, we will find more life than we could ever again. So, first, we die to ourselves, because if we are living for ourselves, we will not be able to focus on anything but ourselves. And then, when we take the focus off ourselves, we find something really worth living for, the Gospel. Jesus poses as question in the end. Is is worth it? Is what you are living for, it is worth losing your soul. Because in the end, we each must make a choice. We can gain the whole world, all the power, all the fame, all the wealth, everything. But, if in that process, we lose our soul, what have we truly gained? Jesus asks us to consider that question this morning. What difficult thing is God calling me to? 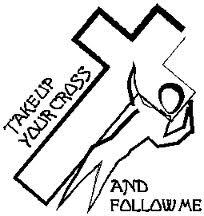 Today, we are called to take up our cross? What does that mean? It means taking the focus off of us, and our “stuff” and focusing on what God is calling us to do. And, today, He may be calling us to something challenging. He may be calling us to something hard. He may be calling us to somewhere that we don’t want to go. And hears the thing. He has promised us, that place that we may not want to go, if He has called us there, that place actually is the way of life. By taking up our cross, we will find life. He has promised us. By dying to us, we can live for Him. Am I finding my life in God or my my stuff? Simple and sweet. What are we living for today? Where is my life? What is the point of my life? Is it for me? My stuff? My dreams? My life? Or is it for God. Scripture tell us that the only way for life is to live for Him. That’s it. That’s the only way. If we live for ourselves alone, in time, we will lose our soul. If we live for the Gospel, we will live. It’s our choice. Today, what are we living for? Today, are we alive, or are we running the risk of losing our soul? Holy God, help us each to remember where our life is found, and help us to make sure that today, and each day, we are living for the right purpose. In Jesus name, Amen.